For the second consecutive year, Stanbridge College has been named to the President’s Higher Education Community Service Honor Roll by the Corporation for National and Community Service. 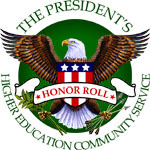 The Honor Roll recognizes exemplary service to America’s communities and is the highest federal recognition a college or university can receive for its commitment to volunteering, service-learning and civic engagement. “The students, faculty and staff of Stanbridge College are delighted to be once again named to the President’s Honor Roll. The commitment to community service is deep and on-going. Our students have consistently involved themselves in projects to serve those in need, and we recognize their efforts in accepting this honor,” said Yasith Weerasuriya, President of Stanbridge College. Stanbridge College’s commitment to long-term community partnerships, in order to create a positive impact on local and global communities and incorporates Service Learning as an integral part of the curriculum and is exemplified in its REACH – Beyond the Classroom initiative. The REACH initiative provides students with opportunities to give back to the community while earning credit towards classroom grades in a structured environment. Stanbridge College Raises Over $2600 for ShelterBox and Japan Relief Project! URGENT APPEAL! Volunteers needed to serve the homeless!